John Keefe of Quartz (left) and Joseph Price of The Washington Post discussed bots and voice assistants for news at the Journalism Interactive Conference on Oct. 20,2017. Students in the master’s program at the Philip Merrill College of Journalism covered three panel discussions at the 2017 Journalism Interactive Conference, exploring news automation, Facebook Live and audience engagement strategies. Below are a few of their stories. Undergraduate students in the broadcast program at the Philip Merrill College of Journalism also covered the conference and compiled a series of short videos showing scenes and dialogue from many of the sessions. Their work is showcased separately on the video page. 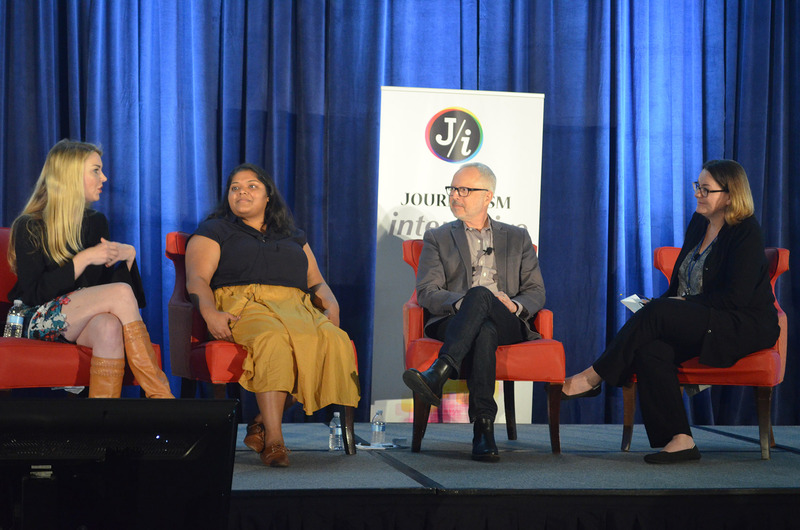 Two product developers shared insights on the intersection between technology and news and the future of digital journalism at the Journalism Interactive Conference Oct. 20 in College Park, Maryland. Speaking at the “Automation in Journalism” panel, John Keefe, a bot developer at the digital news outlet Quartz, and Joseph Price, senior product manager at The Washington Post, lectured an audience of journalism students, educators and professionals on how evolving technological tools help shape the way news is reported and consumed. Keefe emphasized the increased prominence of artificial intelligence, or machine learning, not only in daily life but in journalism. Among the tools he highlighted are analysis bots that can interpret information to find similarities in statements. “The ability to find similarities can be playful and interesting, but it can also be really important,” Keefe said. He singled out an analysis bot used by the nonprofit ProPublica that, using about 1 million press releases from members of Congress, can identify key terms used repeatedly by several congressmen or terms used by one person in particular. “This is useful … [because] you can go look up any congressperson and see what their most unique and focused topics and interests are,” Keefe said. Access to this information, as well as to how different congressmen compare on several issues, can be immensely useful to journalists, he said. Price focused on the potential of voice assistance programs to deliver news to consumers. “I think it’s one of the most fascinating and exciting areas of technology right now,” he said. Among the audio storytelling projects that Price has managed is the Post’s inclusion in the “Flash Briefing” through Alexa, Amazon’s voice assistance device. When prompted, the Flash Briefing provides a quick synopsis of the newspaper’s daily headlines. It has been one of the Post’s most successful forays into voice assistance platforms, Price said, because it provides a positive user experience. “It’s a new, simple habit, and you can do it every day,” he said. While audio devices have limitations as communication tools — they are not conducive to lists or extensive instructions, for example — Price indicated that news consumption through voice assistance platforms may be viable. “About a quarter of our (Flash Briefing) listenership is new audience for the Post,” he said. The “Automation in Journalism” panel was only one of several offered over the two-day conference. The Knight Foundation sponsors Journalism Interactive, whose consortium is made up of the journalism schools at three universities — the University of Missouri, the University of Florida and the University of Maryland — which take turns hosting it. Watch the video of John Keefe’s presentation. Watch the video of Joseph Price’s presentation. Joseph Price believes that voice-controlled smart speakers like Google Home and Amazon’s Alexa are the new frontier for ambient computing. “The technology disappears, and it just blends into your life seamlessly,” said the Washington Post’s product manager at the Journalism Interactive Conference in College Park, Maryland. Price has spent more than a year experimenting with ways The Washington Post can engage its audience through Alexa. On Friday, he shared the lessons his team has learned with journalists and media educators. Most Alexa users ask the device to assist with simple tasks like setting a timer, playing music, or adjusting the heat in their home, Price said. Then there are more complex interactions in which users customize Alexa to respond to their questions. For example, a user can ask, “Alexa, what’s in the news?” and receive summaries from specific media outlets. Price said a survey concluded that their average user listens to The Washington Post’s politics Flash Briefing, a quick news summary, seven times a month. This is one of its more successful projects with Alexa, he said. One of the first Alexa experiments his team worked on – to incorporate The Washington Post’s polling data from the 2016 presidential election – was not as successful. Yet Price and his team concluded that people are not thinking about state-based polling regularly. It’s more likely for a user to ask a question like “How is Trump doing?” which is not as simple to answer. This experiment provided The Post with information about user expectations for future projects, Price said. Their second big experiment focused on another major event of 2016 — the Rio Olympic Games. Price’s team ran into similar user-based problems in this experiment. A user could ask for the latest results of Olympic swimming, but then Alexa would want to know “Which stroke?” and “100 meters or 200 meters?” which became too complicated to engage users. “The lesson learned was to use intelligence to narrow choices and narrow the scope whenever possible,” Price said. Price said the challenge with cooking is that it is not strictly linear. Because ingredients are lists and cooking instructions can be long and detailed, it’s hard for someone to remember all those steps. People also tend to have their own cooking styles. But Price is optimistic that voice control smart speakers like Alexa will improve lives for the better. “The potential of ambient technology that fades into the background is that it enables human flourishing,” he said. 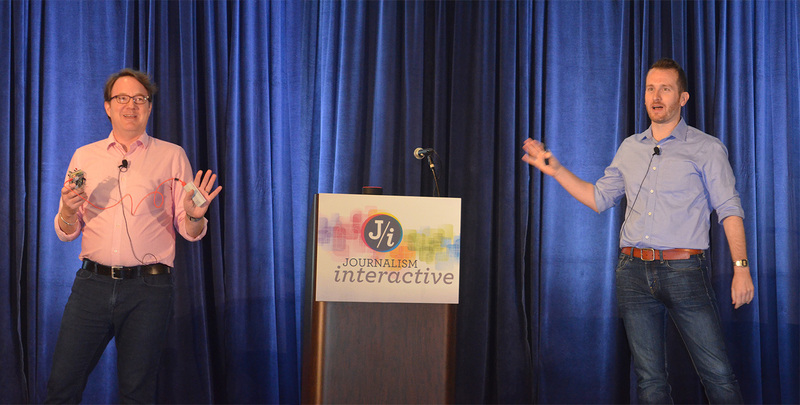 During a session at the Journalism Interactive Conference, bots and digital assistants took center stage alongside journalists and innovators. John Keefe of Quartz and Joseph Price of The Washington Post each brought their experiences of trial and error to their discussion of how automation and interactivity are playing a central role in the future of digital journalism as the technologies develop. While both bots and digital assistants are in their infancies, their rapid development likely will change the way we gather and ingest news in the future, they said. Keefe, a developer for Quartz’s Bot Studio, said automation is changing the way we tell stories by changing the way we aggregate data. One example came from his experience teaching classes on bots at the CUNY Graduate School of Journalism. Student journalists used bots to poll individuals via SMS text messages, asking them questions about their experiences with racial profiling and use of force by police. This data was then logged into a Google spreadsheet by the bots. While it would have taken a small group of students a substantial amount of time to poll large samples of the public, that same group can hand out flyers asking people to text a phone number if they had experienced racial profiling and the bots can ask the survey questions to a much larger sample. During the WannaCry Malware Attack in May, Keith Collins of Quartz set up a bot to monitor the bitcoin wallets that victims were instructed to deposit a ransom into. This bot was linked to the “ActualRansom” Twitter account, which tweeted out every time a deposit was made and ultimately broke the news when money was withdrawn from the accounts, Keefe said. While this data would have been extremely difficult for a person or team to gather, a bot can monitor the account activity in a much more efficient manner, he said. Price, senior product manager for The Washington Post, discussed the newspaper’s attempts at using digital assistants on Amazon Echo and Google Home as an avenue to reach more individuals. These devices are not yet widely popular: 5 percent of U.S. homes have an Echo, while only 2 percent have a Google Home, said Price. However, Price sees them as a viable option for people to get their news with minimal friction. “Voice interaction decreases the distance between thought and action,” Price said. With “ambient computing,” which is embedded in the environment, it is easier for people to have a thought such as “Who won the World Series game last night?” and have it answered just by asking. However, these devices are not without their drawbacks. As The Washington Post found out, while it is easy to get people to try out a new feature or “skill,” it is difficult to make them return and use it again. This is an intrinsic problem with the devices themselves. Digital assistants lack screens, so there are no visual cues to make people interact with them as they would with smartphone apps, which almost beg for attention with notifications, Price said. Additionally, developers have found that digital assistants are limited by their users. Assistants cannot present users with too many choices, because lists are difficult to remember in audio form. Price used the example of going out to eat and having a waiter read off a list of specials. People rarely remember the first option by the time the last one is read. NBC4 morning anchor Aaron Gilchrist describes how he uses Facebook Live to connect with viewers. 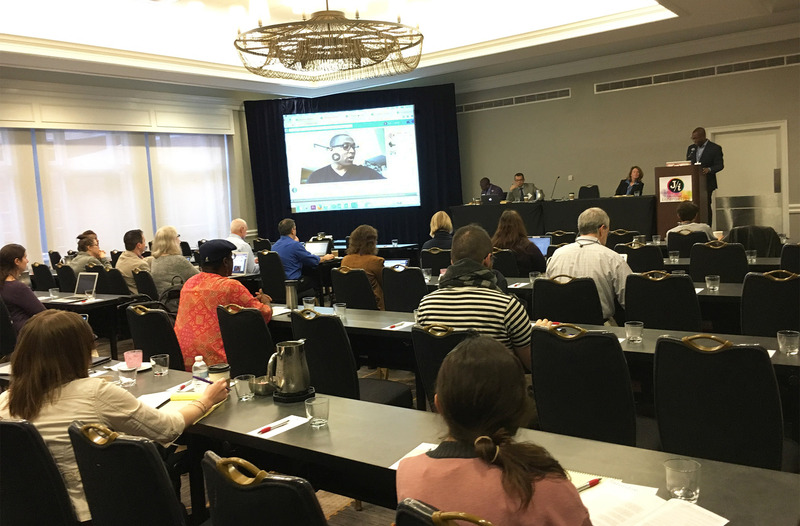 Speakers at Saturday’s Journalism Interactive conference discussed how Facebook Live disrupts the traditional relationship between news organizations and their audiences. Debora Wenger, associate professor and director of undergraduate journalism at the University of Mississippi, said many local television stations use Facebook Live to break news faster and cover more of a story. Journalists can use the tool to report live directly from the field using nothing more than a smartphone. This often means that viewers get an unfiltered look at the news as it is happening. Alejandro Manrique, Cox Media Group’s director of bilingual content, is seeing a shift away from traditional television news pieces that are set up by anchors in a studio. “Now it is more about taking people [viewers] to the place where news is taking place to get a sense of what is going on,” he said. Manrique shared a story that streamed live on Mundo Hispanico’s Facebook page earlier this month. A reporter live streamed a police raid on illegal immigrants in Georgia and provided continuous commentary for nearly 40 minutes as the event unfolded. During a morning broadcast in March, he live streamed from behind the anchor desk. While his co-anchor reported on a story, Gilchrist gave viewers on Facebook a live look at the studio cameras, lights and green screen. The video got over 5,000 views, he said. The simplicity and low costs associated with using Facebook Live also make it a great learning tool for students in broadcast journalism. Howard University Assistant Professor Fredric Kendrick uses Facebook Live to allow students to get comfortable in front of a camera. Kendrick’s students streamed live during the 2016 Republican and Democratic National Conventions. They gave viewers an intimate look at their experiences covering the conventions, he said. Journalists and journalism professors agreed Saturday at the Journalism Interactive Conference that Facebook Live is transforming the way media engage with and teach viewers. “We’re seeing it as a tool to cover more of a story,” said panel moderator Debora Wenger, associate professor of journalism at the University of Mississippi. Facebook Live has soared in popularity since becoming available to all Facebook users in 2016. Wenger said Facebook reported that Facebook Live videos get 64 billion views a day. Videos are also viewed three times longer and generated 10 times more comments than other videos, according to the company. Wenger said many news outlets, particularly local broadcast stations, see this as a way to increase their audience. ABC 7 in Chicago streamed 371 live videos in 2016, which got more than 69 million views, according to a research project conducted by Wenger. Smaller stations, like KPLC in Lake Charles, Louisiana, got smaller but generous numbers, Wenger said, as they break news faster and reach more people. NBC4 anchor Aaron Gilchrist said it isn’t enough for news stations to just have strong news stories. Professors have started to actively integrate Facebook Live into their curriculums to better prepare their students for a business that is becoming more and more personal. Dr. Fredric Kendrick, an assistant professor at Howard University, said university students have the opportunity to break news from the field with Facebook Live. Teaching students how to do that involves instructing them on how to be competent in front of a camera, he said. Kendrick added that students must learn how to be controlled in front of the camera. He said they have to learn how to present themselves in a professional manner when using Facebook Live. Panelists at the 2017 Journalism Interactive audience engagement panel included (left to right) Mary Bowerman of USA Today, Shefali Kulkarni of BBC News North America, Dennis Powell of ABC News and Karin Assmann of the University of Maryland. Three leading journalists and social media strategists shared techniques Saturday for engaging audiences in the changing landscape of online journalism. The panel at the Journalism Interactive Conference discussed changes that media organizations are making to improve audience engagement, highlighting the use of diverse content across platforms like Facebook, Twitter and even email to keep the attention of readers and viewers. Today, journalists hope to “meet people where they are,” said panelist Mary Bowerman, network social media editor at USA Today. Bowerman described using Facebook Live and other social media as useful tools to give viewers meaningful news quickly as it happens. However, in times of crisis, other news delivery formats are just as effective. Bowerman cited the use of an email newsletter with important information for Floridians affected by Hurricane Irma as an example of taking the news to people through a more traditional format. Bowerman identified flexibility and adaptation as important factors in continuing to engage a community of news consumers who sometimes have short attention spans. “There are times when something will go crazy on USA Today’s Facebook,” Bowerman said, but on other platforms, the same content will tank. She said she has learned to change things up and experiment to engage audiences. Panelist Dennis Powell, a senior producer at ABC News, said he tries to give the audience “compelling and authentic” content. Powell said ABC News mixes softer content like cat videos with more hard-hitting news to keep audiences’ attention. A tool like email blasts may sound “old-fashioned,” but they do well, Powell said. Panelist Shefali Kulkarni, who runs social media and audience engagement for BBC News North America, said email is the No. 1 use of the internet for users in the UK. Kulkarni urged attendees to think about journalism in nontraditional formats.